Online selling has changed dramatically over the years. One major adjustment is the essential requirement of an outstanding e-commerce platform. In the days of old, a few pictures on a website and the ability to take payments by phone, email, or fax was state-of-the-art. Today, e-commerce platforms must provide an attractive layout; the ability for quick, efficient, and safe transactions; mobile phone and tablet capabilities; inventory management capacity; and so much more. The good news is that there are many excellent platforms to choose from as we officially head into the tail end of the 21st century’s second decade. Prior to investigating 10 of the best e-commerce platforms, remember that there are two main categories of platforms to choose from: hosted and self-hosted, and each has strengths and liabilities. When subscribing to a hosted platform, your host will provide the website software and online storage for all of your e-commerce needs. Hosted sites typically come with customer support, technical support, and, since their business depends on your loyalty, downtime is rare. The e-commerce company provides the software, but you must arrange for your own web hosting. While finding your own host is not hard and can be cheaper than package platforms, it is an extra step that is not for everyone. You will have multiple fees with this approach (platform, web service, domain name, and CDN, but there is no limit to your freedom and creativity. Within the self-hosted marketplace, there are no e-commerce platforms with as many loyal customers as Magento. Within the hosted platforms, Big Cartel and Volusion have been losing customers to Shopify, the reigning hosted-platform e-commerce champion. However, Shopify has been losing ground to Bigcommerce, likely due to the competitor’s increased focus on marketing and feature expansion. While these names have been perennial leaders in the e-commerce marketplace, there are others who may better suit your particular needs. 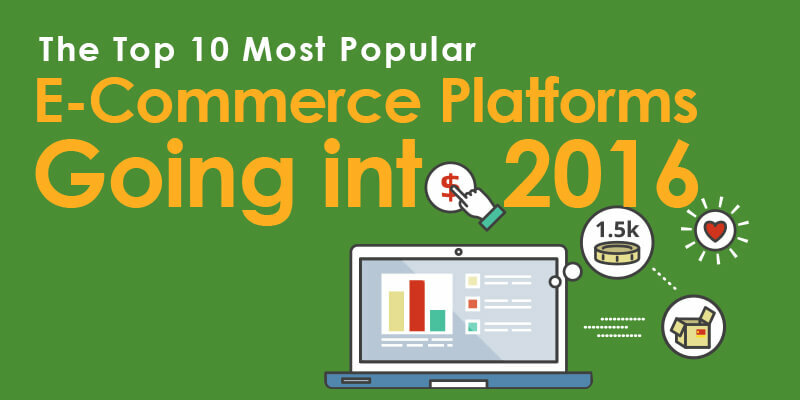 So, with no further ado, the top 10 most popular e-commerce platforms going into 2016. Shopify has been in the market for a full decade. The brainchild of Canada’s CEO of the year, Tobias Lütke, and his partners, it has the trust of over 100,000 retailers, including General Electric, Amnesty International, and Tesla Motors. In short, it is simple enough for the novice, but advanced enough to power sites for international mega-players. One of Shopify’s advantages is a comprehensive dashboard. There is no need to jump from site to site or page to page to make adjustments, run reports, or add products. The Point-of-Sale feature allows Shopify to sell products in a retail environment as well as online. They even offer a number of add-ons that can be purchased for your brick-and-mortar store, such as a receipt printer and barcode scanner. Shopify boasts a plethora of themes, both free and paid, includes a built-in blog, and has one of the largest add-on app stores in the market. The SEO tools ensure your site can be found by your customers. With five different pricing plans, you will be able to find a package that suits you. The shopping cart features an 128-bit Free SSL certificate. Shopify offers 24/7 customer support with phone, email, and chat features, as well as a comprehensive FAQ section. Bigcommerce is making waves in the e-commerce marketplace. They are another great option for users who do not have or desire to use programming knowledge. Offering three payment plans for different levels of support, the mid-range level is quite affordable and boasts no transaction fees on their superior payment system, checkouts that are hosted on the domain, unlimited product listings, an abandoned cart saver, and so many more advanced options. Bigcommerce does not have as many themes and designs as other top platforms, but they do have 16 free and 42 paid options. There are many features that today’s customers demand, such as image zoom, gifting, and coupon codes. The platform offers SEO optimization included in all packages, including the ability to modify titles, headers, tags, and descriptions. Specialty features include live chat, content delivery network (CDN) listing, 301 redirects, and built-in Facebook features such as a Like button, Facebook OpenGraph, and the ability to sell products through Facebook using Social Shop. Bigcommerce has excellent security features and features 24/7 support, including live chat, email, phone, and FAQs. 3dcart is one of the better platforms for beginners and smaller shops. The editor’s drag and drop approach is not the most powerful, but it helps inexperienced users avoid HTML code and Cascading Style Sheet (CSS) modifications when adjusting the pages’ design. This means that you are not locked into preset templates, and you don’t need to be a programmer to create stunning pages. This is important, since 3dcart does offer a limited number of themes. When combined, the themes and the template design tools allow users to quickly and easily create a unique website and online store. For users with WordPress experience, 3dcart allows integration with WordPress sites. An included mobile app allows smartphone and tablet use, and the platform works well with eBay, Amazon, affiliate links, and social media sharing. 3dcart is perfect for those who utilize drop shipping companies for their orders. Included in the price is standard 128-bit SSL encryption with a built-in McAfee firewall. One of the special features is a security feature known as a fraud score, which flags purchases that appear to be risky based on a specialized analysis. Customer support can be contacted by phone, email, and live chat. There are also tutorial videos and an extensive FAQ section. Volusion has been in the business since 1999. They offer cloud-based, hosted platforms with enough bells and whistles to attract big-name e-commerce giants like Intel and 3M, as well as nearly 40,000 others. As with other top-ranked platforms, Volusion features a highly useful dashboard, eliminating the need for expensive add-ons, and allowing efficient modification and adjustment of the site. There are over 350 themes, and a quarter of them are free. In past years, many of the free templates were cheap and chintzy; this is one of the major upgrades from Volusion. They now offer many themes that compete with any of the best e-commerce sites. A few of the special features included in all Volusion packages are the Deal of the Day and deal countdown timer, which encourage repeat business and simplify limited, short-term discounts; a MyRewards program using points for repeat and frequent shoppers; and full integration with eBay and Amazon. You can also sell products through your Facebook store. The platform is fully mobile-optimized, including checkout operations, so browsing and purchases are easy from any device. Volusion offers four pricing tiers running from $15-135/month. Every plan includes free setup and unlimited storage, and SEO optimization is built-in for all plans. One of the greatest differences between the plans is found in the support. All plans offer 24/7 online chat, email, and phone support, except for the $15 plan, which only offers online support. You do need to purchase your own SSL security package, but, since all hosting is provided in-house, and the site is up 99.9 percent of the time, you data is as secure here as it is anywhere. Probably even more so. Magento is a powerful self-hosted e-commerce tool. The community edition of the software is free; however, you need to find your own hosting company and buy your own domain name and CDN. Magento features over 100 themes, and many of the best ones are free. The good news is that Magento has nearly unlimited customization, a huge app store, and you can sell an unlimited number of products. The customer dashboard is useful, but not as intuitive as some of the others. It does include upsells, cross-sells, quantity discounts, and a saved shopping cart. You can make images zoomable, and reports and analytics are available right on the dashboard. While the dashboard takes a little getting used to, it is highly responsive and feature-rich. Magento is often used by designers, since a knowledge of web design is recommended. The platform provides top-quality SEO support, including friendly URLs. For security, Magento is PCI certified and supports SSL security. Support-wise, Magento uses community support forums to address problems or issues. This is a global support network that has been around for years, so most anything you could ask has been or will be answered. You do have to know the right question to ask and be able to find the answer; however, there are also businesses who specialize in Magento support and service. For a self-hosted platform, it is hard to go wrong with Magento. Big Cartel is the least expensive of all top-rated platforms. While there are higher service levels that can be purchased, the base level of the Big Cartel e-commerce hosted platform is free. Zero, zip, nada. Making things even more tempting, their most expensive plan is less than many of their competitor’s cheapest plans. Big Cartel is entering into its second decade of service and boasts over 250,000 customers. The platform is very popular in the global arts community. You are limited in thematic expression, with only nine themes available, and many of the bells and whistles available on other platforms are missing. That said, Big Cartel is extremely easy to use and provides an excellent entry-level option for a small business with less than 25 products. While most of the modifications are done through basic point-and-click technology, more advanced users do have the option of altering HTML and CSS codes. Once URLs are created, however, they cannot be altered. On the up-side, Big Cartel offers some high-end options, such as limited-time discounts and a connection with your Facebook store. Security features are excellent and include top-quality SSL standards. Customer service is limited to email support from Monday to Friday 9 a.m. to 6 p.m., but they do have several tutorial videos and an extensive FAQ site. Wix has been in the web design game for a very long time and has recently crossed over into the e-commerce market. They bring with them a world of knowledge in SEO practices and features, design templates, and intuitive features. They may not be as polished as some of the other platforms, but, for the money, you could do a lot worse, and Wix is getting better every year. The Wix e-commerce platform features an intuitive dashboard with a drag and drop interface. In fact, the ease-of-use factor is Wix’s strongest selling point. Even novices should have no trouble navigating the editor, adding pages and images, incorporating social media, and so many other integrated components. Wix offers limited templates, but they are mobile-compliant and clean. While advanced users can use HTML and CSS codes, there is little need to since the customizations are done quickly and efficiently through the homepage. Wix offers six pricing plans that start way below the average cost of most comparable platforms. The payment comes with a year of domain service. SEO tools are included and fairly powerful. Support is online only, unless you purchase a premium support package, although they have an excellent FAQ selection. The greatest drawback to Wix is the lack of SSL certification, meaning that purchases have to be routed through a merchant account page. While this is still safe, customers don’t always trust redirects, especially with the lack of an SSL certificate. Fortune3 bridges the world between advanced and basic features. The level of service and complexity of your site should be determined by the number of products you plan to sell. Fortune3 features unlimited storage and bandwidth on all plans, and has no transaction fees. The site builder is intuitive, comes with over 100 quality templates, and all of the standard sales and marketing features are available. In order to modify the templates, however, you need to have experience with website design. Fortune3 is mobile-friendly, and it has POS integration. Security is essential, and Fortune3 boasts security beyond the standard with 256-bit SSL protection, data backups, and a firewall-protected network. Customer service includes email, live chat, and telephone support, as well as videos and an FAQ site. Core commerce is a great option for a small business with limited products, few videos, and a novice level of technical knowledge. The interface is very simple to use, so setup and maintenance of your site are quick and efficient. Every plan contains all of the site’s features. The main difference in plans is found in the amount of storage that is allotted and the bandwidth provided. All of the standard e-commerce platform offerings for shopping carts and marketing tools are included, such as the ability to run affiliate programs, reward programs for frequent buyers or loyal customers, and daily deals postings. Setting Core Commerce apart is the ability to program the store in multiple languages, including the live chat feature. Core Commerce’s security is outstanding, with a 256-bit SSL which goes beyond current standards. There is also fraud protection and fraud scoring, which evaluates the customer risk and alerts you to the potential of fraudulent transactions. Customer support includes live chat, email, and telephone support, as well as searchable FAQs and a plethora of how-to videos. Woocommerce is different from the other top-ranked platforms, but it must be included on any honest “Best of” list. While Woocommerce is not a “platform” per se, it is one of the most used retail programs in the world. Specifically, Woocommerce is an e-commerce plugin for WordPress websites which enables you to use your current website as a storefront instead of purchasing specialized e-commerce software, transferring, or duplicating your site. In addition to a payment processor, Woocommerce provides completely customizable themes, extensions, and plugins. Best of all, it is free to download and install, and there are no monthly fees (although you can pay for more advanced options, themes, and extensions). Because Woocommerce works with WordPress, you can combine the Woocommerce themes and the WordPress themes and extensions for a nearly limitless array of customized options for your storefront. Since Woocommerce is a plugin and not a platform, you have to provide everything else, which includes a web host, domain name, website, and so forth. The benefit to this situation is the freedom to place your site anywhere, and you can purchase your domain name from anybody. Customer support is run through “help tickets” directed to the proper department. A representative will get back to you. During your wait, you might answer your question with one of the myriad videos or by using the extensive FAQ site. As we enter into 2016, your choices for e-commerce platforms are better than ever before. Based on your familiarity with web design, SEO options, and using e-commerce software, you should now be able to choose wisely from the top-ranked platforms listed above. While each offers benefits and potential shortcomings, any one of them could be your ticket to major success in the online marketplace.